Yes - I'm off to our local 'Makers Market' next weekend. If anyone is interested and lives close by it will be in Bairnsdale next Saturday the 4th of June from 9am to 2pm at Boucher Hall (cnr Wallace & McKean St, Bairnsdale). 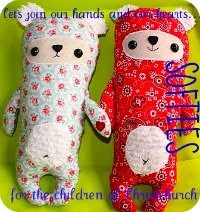 I will have some softies and my patterns for sale at the market and I am sharing my stall with my lovely friend Lisa who has made some delightful softie's too. These market are held 3 or 4 times a year and they are full of wonderful handmade goods made by some very clever people. I'm looking forward to seeing what everyone else has made and talking with some of these talented people. So I've been very busy sewing and printing patterns and getting things organised. Here's a picture of the neat end of my dining room table with some of the projects I've been working on. 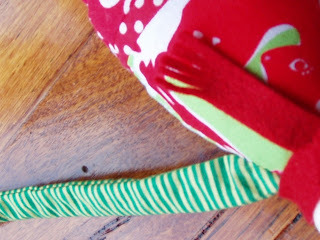 And as promised here is also a sneak peak of my project I'm working on for the Cookies & Cream Craft Christmas Club. Sorry I can't show you too much more - but if I did you would guess what it is and it's supposed to be a secret until those who have joined the club receive my pattern later in the year. Sandy is still taking sign ups for this club which runs for 5 months - from July until November 2011 and when you join the club, each month you will receive an exclusive paper pattern designed especially for you by some wonderful Aussie designers, along with a special gift, and a bit more. 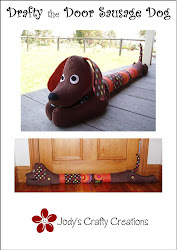 Both pattern and gift will be a surprise until the postman visits you. The designers are: Gail Pan of Gail Pan Designs, Toni Alexander of The Red Boot Quilt Company, Michelle Ridgway of Rag-Tag Stitchn’, Jody Herbert of Jody’s Crafty Creations (YES - That's ME!! ), and Bronwyn Hayes! So if you wish to sign up just click on this link HERE and sign up! I'm already in.. but now you have grabbed my interest even more...wonder what it could be? Yes, have fun and sell heaps at the Markets, Jody. *grin* Got your business cards ready? Hey Jody - I am SOOOOOOO excited about sharing the Market with you on Saturday. I'm just about all organised - just a couple of last minute softies on the go. I've designed my business cards and getting some printed on Tuesday. 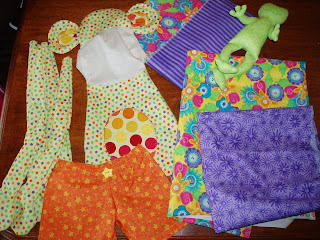 I love the fabric you're using on Magoo - he is going to look awesome. Your projects are looking great, thanks for the sneak peek! Hope the market went well for you.